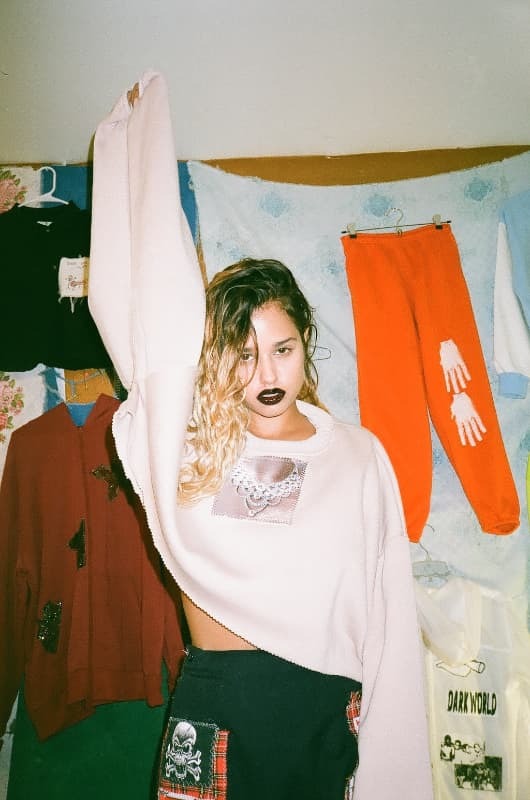 Julie Kucharski of Left Hand LA turned a love of thrifting and patch-working into a cool brand. 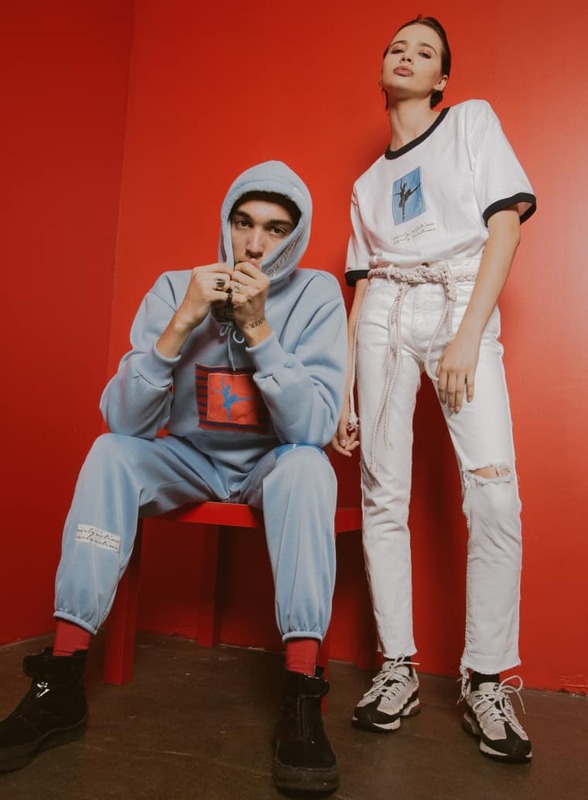 Left Hand LA is a one of a kind fashion line by Julie Kucharski, that combines the DIY aesthetic of 90s grunge with a millennial's digital collagist approach to fashion. Kucharski, who is originally from South Carolina, repurposes old garments, reimagines denim, and covers everything with unique patches that she’s created over the years. Every piece in the two-year-old line is handmade as one-of-one, like a sweatshirt with a patch of Gucci Mane’s face superimposed onto a map of Maine, or a black jumpsuit lined with bars of floral print. Kucharski’s design studio is in a garage near Melrose and Fairfax in L.A. Over the phone she told me that distressed clothes hang from every surface and she blasts music while playing around with new design ideas. Describing herself as “the weirdo” — one of the few arty people in her small town — Kucharski learned to sew as a kid, and began making clothes for herself and class mates. After high school she lived in London, and studied fashion and graphic design at the Central Saint Martins affiliate, London College of Fashion. She couldn’t go back to the South, and moved to L.A. to start the line, whose name takes inspiration from Kucharski’s dominant hand, and a childhood obsession with TLC’s Lisa “Left Eye” Lopez. 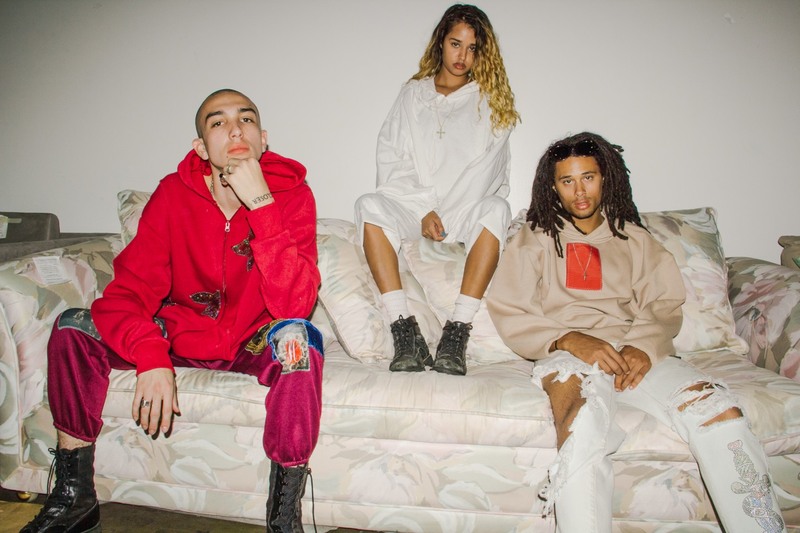 The FADER talked with Kucharski about how she got Rihanna and Swae Lee into her designs and why she wants to keep making one-of-a-kind garments. How did you get into patch-working? I was always thrifting. There was this really cheap thrift store back home where everything was a dollar. After [teaching myself] to sew I was able to thrift and alter clothes completely. My first love was sewing but graphic design was always part of it too. I started printing images and using glue and water mixed together and I'd paint it over vinyl and then create a patch and sew it on things. It wasn't necessarily washable; it was super collage-y. I was always cutting up Teen Vogue and putting pictures up all over my furniture and my house like Mod Podging so I think that, and my sewing skills, are what brought the patchwork about. Where do you get most of your patches from? It's all over. It started with submissions. I'd post online and be like, ‘Anyone who wants their art as a patch email me and I'll combine it in my crazy collages!’ and people were so down. It started off there and then moved to random Google searches. I'd have themes like, ‘girls with guns.’ The patches are even from old magazines, old books. I'll go to the library and find the oldest book on gems and jewels and scan them in. There are over 5000 different patches. Every piece you make is unique. Why do you like doing one of ones? That's my favorite part, even though I know it's against the odds and people always say to me — stores especially — that I need to mass produce this stuff. I just sewed my 500th tag in the other day; that means 500 completely different designs are floating around. My favorite part is not even to learn new design techniques or for the customer to have something that no one else has, but just knowing there are so many different pieces floating around the world. Sometimes I'll see pictures of pieces I made a year ago that I totally forgot about. It's a good learning experience because if I was just sewing the same five things or 20 designs it would get boring. How did you get your clothes into stores? I was always making my own clothes, because once you start sewing you find things you like when you're shopping but you're also like, ‘This could be different, this could be cooler.’ It really started when I was wearing jeans that I made myself to work, and my boss asked me if I would sell them at his store in Japan called GR8. It's like a really cool streetwear store that's right in the middle of Harajuku. After I did a really big order for his store — I did 60 different items alone — I thought if I could do that I could do anything. I reached out to VFILES in New York City after that. Danielle Greco and Rox Brown, they just loved the clothes. Last year they took a few pieces and it all sold out so this year they bought a huge chunk and it sold out again. And how did Rihanna and Swae Lee find your clothes? Swae Lee got it from VFILES. He bought the funniest piece: it says “my bad” embroidered all over and has photos of kids jumping on a trampoline. Rihanna was one of those people that, since I was a little, little kid, it was on my bucket list to get her to wear my designs. That's the cool thing about L.A.: all these celebrities live here, their stylists live here. I just reached out to everyone. I collabed with my friends Dark World, a syndicate in Massachusetts and I knew that that sweatsuit was perfect for her. I sent photos and that was it, one day a few months later I saw her wearing it and I was like ‘No way! She wore it!’ That's one of my favorite accomplishments this far. Julie: She'd come over to hang out and we'd stay up so late just being girls and she's really good at design too. She'll help me sometimes and say, ‘I like that patch can we stack it on a shirt before we leave the house?’ We've become super close because we have similar creative mindsets whether it’s for music or fashion. Both of us are just... are we normal or are we not normal? Tommy: [Laughs] I don't know. Julie: We're just both whatever we are and it works. I want to tell young designers to just keep it up. The majority of my fans are kids that are doing the same thing as me — crafting at home — and it's cool to talk to a few of them and give them design opinions. That's how I started; I was just a little kid trapped at home in middle school and high school figuring out how to do something that wasn't homework. You never know what's going to happen.